The world premiere of the highly-anticipated fly fishing film Finding Joe Brooks is set to air on Father’s Day weekend, June 15-17 on Sportsman Channel (Friday at 7:00pm CT) and World Fishing Network (Friday at 9:00pm CT), and Outdoor Channel (Saturday at 6:30pm CT). One of the most iconic fly fishers of the 20th century, Joe Brooks wrote for many of the top outdoor publications in the nation including Field & Stream, Outdoor Life and many others. 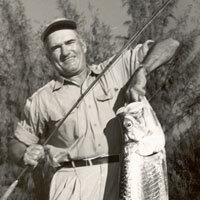 Brooks was a born natural with the fly rod, whether casting or catching, much like his good friend and fellow Maryland native Lefty Kreh. His articles and books on our sport gained national attention propelling him to become one of the most respected fly fishers in the industry. I was a young boy still mystified by this thing called "fly fishing" when American Sportsman first aired on the ABC Network. Brooks was a frequent guest, and his adventures with the long rod were my early inspiration. Although my maternal grandfather was an accomplished flyrodder and fly tier, by this time he had passed. Those American Sportsman episodes - especially with Joe Brooks - were the next steps to my lifelong pursuit of this sport. I'm really looking forward to this film, and hope you are too!